Humans can become confused and disoriented -- and even a little queasy -- in an alien world where up and down have no meaning. August 7, 2001: Imagine waking up, startled by the bright flash of a cosmic ray inside your eyes. Groggy from sleep, you wonder ... which way is up? And where are my arms and legs? Throw in a dash of vertigo and occasional mild illusions, and you're beginning to sense what it can be like to live in orbit. Of course, it's not always so bad -- otherwise no one would want to become an astronaut! Nevertheless, first-time space travelers can be surprised by some very unearthly sensations that can confuse and amuse the astronauts who feel them. Consider, for example, "up" and "down." On Earth we always know which way is up because gravity tell us. Sensors in the inner ear, which are part of the body's vestibular system, can feel the pull of gravity. They signal the brain with information about our body's orientation. In space, however, the vestibular system doesn't sense the familiar pull of gravity. The world can suddenly seem topsy-turvy. Former shuttle astronaut Robert Parker recalls: "One of the questions they asked us during our first flight was, 'Close your eyes ... now, how do you determine up?'" With his eyes closed, he couldn't tell. Up and down had vanished. Another astronaut reported a strange experience when he woke up one day in orbit. As he opened his eyes the room was rotating around him! Back on Earth he always slept on his right side. By force of habit his brain expected "up" to be on his left at wake-up time. He awoke in space to find the ceiling directly above his head. And he felt an odd sensation as his brain adjusted. "My reference frame rotated clockwise until [the room] aligned with my own personal sense of up," he recalled. "The sensation was so definite and strong that I could almost feel myself [turning] counterclockwise." Space travelers in science fiction rarely have such problems. On Star Trek's USS Enterprise, for example, artificial gravity provides direction cues for the crew. Captain Kirk never gets out of bed upside-down. Without artificial gravity, however, the designers of the real-life International Space Station and the Space Shuttle must rely on different tricks to establish a common sense of "up". For example, all of the modules on the ISS will have a consistent "up" orientation. And the writing on the walls points in the same direction, too. Shuttle mission specialist John-David Bartoe remembers his first days in orbit: "I followed the advice from my commander, Gordon Fullerton. He recommended that for the first few days we always keep ourselves oriented up with respect to the writing on the walls and with respect to the other crew members. This worked fine for me. The vestibular system isn't the only one affected by the absence of weight. The proprioceptive system -- that is, nerves in the body's joints and muscles that tell us where our arms and legs are without having to look -- can also be fooled. Without the stresses in the joints usually caused by the pull of gravity, this sense is sometimes dampened. "The first night in space when I was drifting off to sleep," recalled one Apollo astronaut, "I suddenly realized that I had lost track of ... my arms and legs. For all my mind could tell, my limbs were not there. However, with a conscious command for an arm or leg to move, it instantly reappeared -- only to disappear again when I relaxed." Another astronaut from the Gemini program reported waking in the dark during a mission and seeing a disembodied glow-in-the-dark watch floating in front of him. Where had it come from? He realized moments later that the watch was around his own wrist. These sorts of mismatches between what the eyes see and what the body feels can trigger a malady called "space sickness." Scientists think it's much like "car sickness," which you can get right here on Earth by trying to read in a moving car. The inner ear detects the motion of the car but the eyes -- staring at a page filled with unmoving words -- do not. "When people go up into space, many will immediately get space sickness," says Dr. Victor Schneider, research medical officer for NASA's Biomedical Research and Countermeasures Program. While a few astronauts are apparently immune, most can experience symptoms ranging from mild headaches to vertigo and nausea. In extreme cases prolonged vomiting can make an astronaut dehydrated and malnourished. 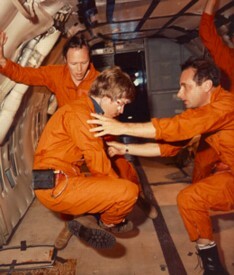 Left: Before blasting off for space, astronauts try to acclimate their bodies to space by riding the "vomit comet" -- a KC-135 airplane that flies parabolic arcs to create short periods of weightlessness. Fortunately, the brain quickly adapts. It learns to trust the eyes and reprograms signals from the vestibular system to reconcile the mismatch. "Space sickness relieves itself after about 3 days, although individual astronauts and cosmonauts may have a relapse at any time during their mission," Schneider says. Indeed, space sickness is capricious -- when it will happen and who will get it can be hard to predict. 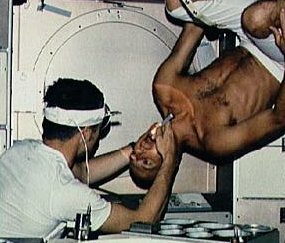 Some astronauts who show an exceptional tolerance to motion sickness when flying jets suffer the worst symptoms upon arriving in space. "This occurs on Earth as well," adds Schneider. "For example, gymnasts who perform acrobatics and do not get motion sick may get sick on a roller coaster or in the back seat of a moving car." Figuring out how to prevent space sickness -- and how to treat it when it happens -- is a high priority for NASA. 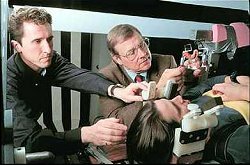 For that reason, in 1997, NASA helped establish the National Space Biomedical Research Institute (NSBRI) where researchers study how humans adapt to weightlessness and develop "countermeasures" against maladies like space sickness. Much of the NSBRI's research is conducted on Earth and can directly benefit millions of patients that never leave our planet. For example, an estimated two million American adults suffer chronic impairment from dizziness or difficulty with balance. And nearly one quarter of all emergency room visits include a complaint of dizziness. Figuring out why we're mixed up in space can have some down-to-Earth benefits! Key issues under investigation at the NSRBI include the psychology of long-term space flight, physical changes to bones and muscles in weightlessness, and of course the adaptation of the vestibular system. Science@NASA will explore these questions and more in a series of ongoing articles about humans in space. Editor's note: Quotations of anonymous astronauts in this story are excerpts from the paper "Anecdotal Information on Space Adaptation Syndrome" by Harrison H. Schmitt and Donna Jane Reid. The astronauts' names were omitted from that paper for reasons of privacy and, so, are omitted here as well. Also, the opening paragraph of this story mentions flashes of light seen by astronauts inside their eyes. These are caused by cosmic rays and were first reported by Apollo astronauts. Click for more information. Gravity Hurts (So Good) -- (Science@NASA) Strange things can happen to the human body when people venture into space -- and the familiar pull of gravity vanishes. Spaceresearch.nasa.gov -- NASA's Office of Biological and Physical Research funds the search for countermeasures to the unearthly sensations of space. Earth Benefits -- astro aren't the only ones who benefit from understanding how humans adapt to weightlessness. 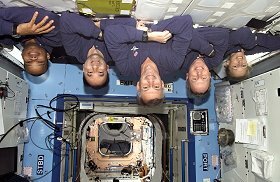 Right: Despite space sickness and occasional disorientation, living in space must also be a lot of fun! 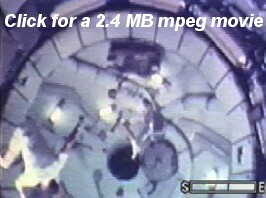 Click on the image to see a 2.4 MB mpeg movie of Skylab astronauts playing around with space-acrobatics.